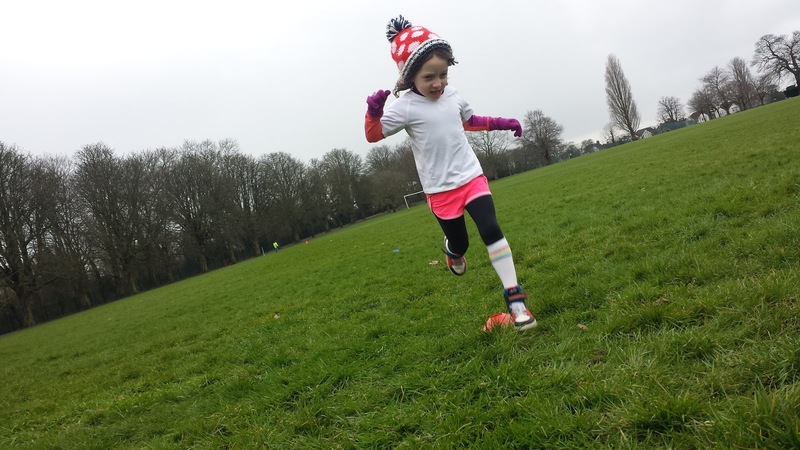 After a 6 month absence from junior parkrunning, my daughter, Matilda, was quite keen to get stuck in this weekend. She didn't fancy either of her most-visited venues (Lesnes Abbey / Gravesend) but she was up for trying out a brand new venue. By mere coincidence a new local venue was having its inaugural event so we decided that this would be the place to go. So we got ourselves up and dressed nice and early and headed out on our 15 minutes journey down the road to Eltham. Eltham lies within the Royal Borough of Greenwich in South East London. 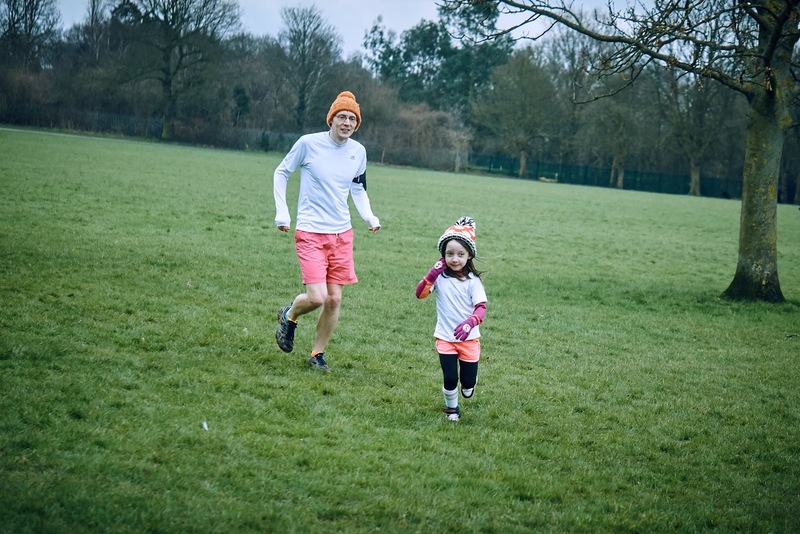 I hear that it has an unusually high quotient of green space, so it only makes sense that some of it be used to host parkruns or junior parkruns. To date there is only one full 5k parkrun within the Royal Borough of Greenwich and that is Greenwich parkrun which takes place in Avery Hill Park [my blog entry], which is also in Eltham. That park is just a stone's throw away from Eltham Park South which is now home to Eltham junior parkrun. Eltham Park South is located just to the south of the A2 and is the larger of the two sections of the overall park which also includes the imaginatively named Eltham Park North. It is mostly open grass space but also has a few outcrops of trees and although the surrounding roads are hilly, the park itself remains fairly flat. The park is included in two of London's major walking routes - The Capital Ring which is a route that completely encircles inner and central London and covers 75 miles in total. The park also forms part of the Green Chain Walk which covers 50 miles through various green spaces in South East London. Travelling to the venue: There is a free car park just off of Glenesk Road or you can simply just park on Glenesk Road itself which is completely free from restrictions. The closest train stations are Falconwood and Eltham and the buses 132, 162, 286 and the B15 all stop within a short walking distance of the park. Facilities in the park consist of tennis courts, an outdoor gym, children's playground and a building which houses the toilets and cafe. This building is a good landmark to head for upon arrival as it is adjacent to the main start/finish areas. Being an inaugural event, there was a bit of a buzz in the air and the start finish area was looking superb as we walked from Glenesk Road to the meeting point (via the playground of course). Matilda was particularly excited to see the finish funnel decorated with balloons. 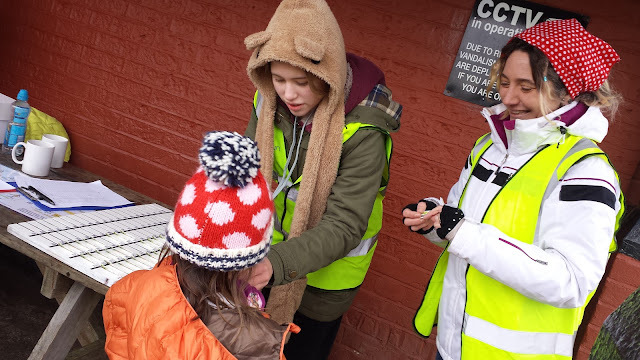 After a few hellos, Matilda decided that we should have our own pre-official-warm-up warm-up so we loosened up our limbs until just before 9am, the day's run director called the crowd to attention. 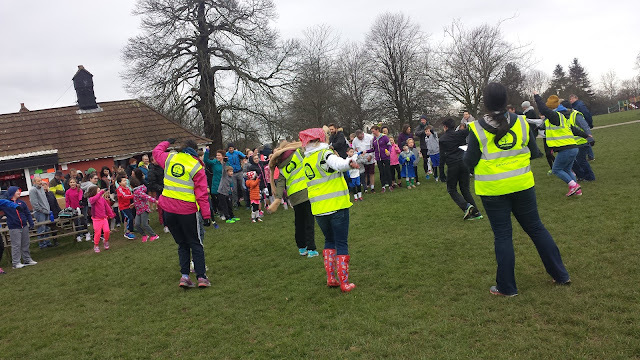 A few minutes later the official warm-up began - junior parkruns all loosely follow the same warm-up session which I always find is a nice fun way to get the kids (and parents) fired up. The start line is just a few metres along the path just outside the tennis courts and once the 51 junior runners were in place, the inaugural Eltham Junior parkrun was underway. The course is made up of two laps and takes place on a mixture of tarmac paths and grass with the grass making up approximately three quarters of the run. 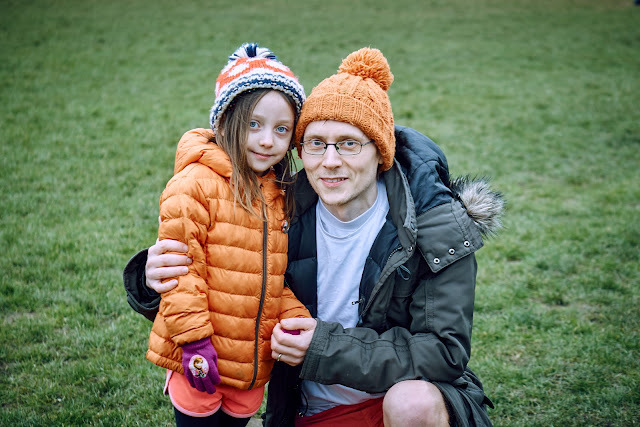 While on the grass there is no natural path or line to follow so the course is marked with small cones which if you have read some of my other junior parkrun blog entries tends to result in us playing a game of 'jump over the cones'. 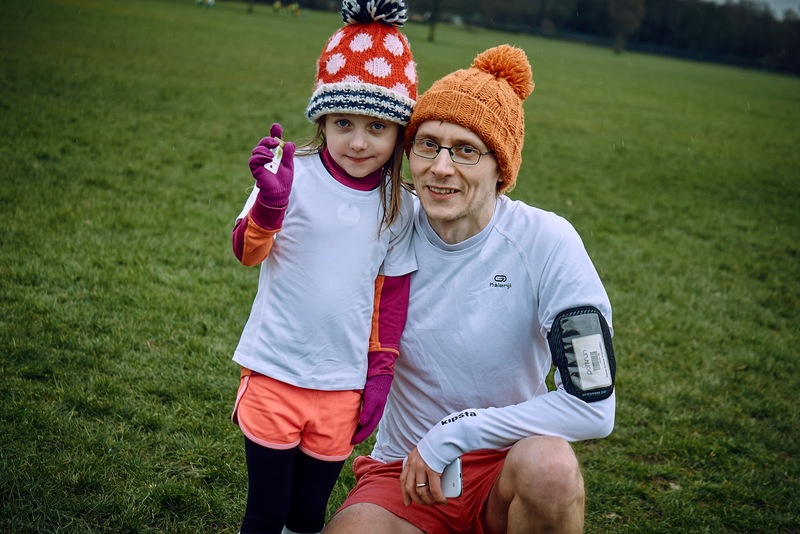 This certainly makes things more interesting for the younger runners. The main focal point whilst on the grass is a big tree at the far end which acts as a turnaround point. Throughout the morning I noticed that the photographer, Bruce Li, was asking us and the rest of the attendees to do lots of things including star jumps and waving. It wasn't until later that evening that I realised that not only had he been taking some fabulous photos, but he had also produced an amazing video showcasing the event. It's brilliant and is definitely worth a watch. 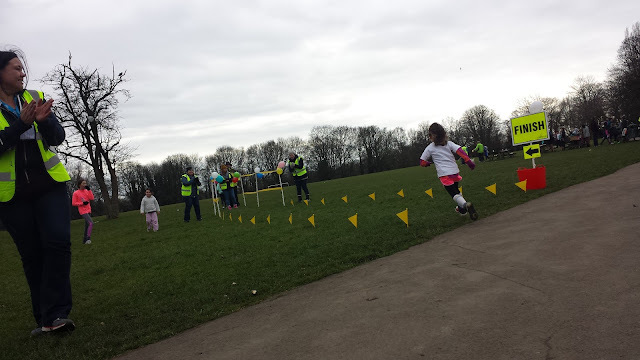 At the end of the second lap, the runners (children only) turn into the finish funnel. At the inaugural event this involved quite a hard 90 degree turn from the main path. If there was any feedback I would give it would be to adjust the position of the finish funnel to make the turning angle a little easier to negotiate. Barcode scanning took place over near the café building where there was some shelter from the cold wind. And with that all done we decided to order some toast for breakfast from the café which we sat and ate the wooden picnic tables. We also managed to obtain a slice of inaugural cake which is officially the most delicious type of cake known to human-kind.